A great picture evokes feelings that go beyond a simple appreciation of aesthetics. A photo of a sunset may have beautiful colors and hues for your eye to devour, but it’s the place the image takes you to that makes it special — it can make you imagine the sun on your skin, and you can almost hear the sounds of the surroundings coming to your ears. The travel photography that we feature on FvF is for us some of the most powerful imagery, and each photo tells its own story. Over the course of 2015, our friends and contributors have made photo submissions to the FvF Travel blog that repeatedly make our jaws drop and eyes widen. Here we present a selection of our favorites from the year. 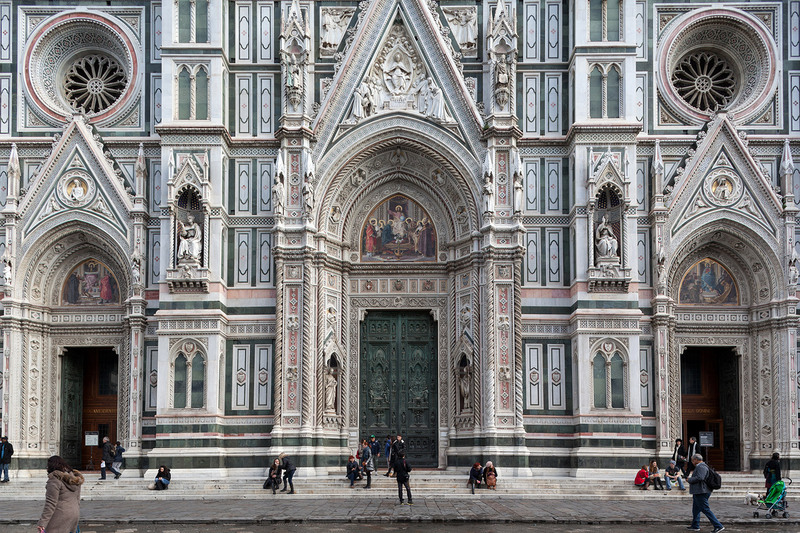 Duomo of Florence • Fran Parente • Florence, Italy "What drew my attention when I took this photo was how you lose yourself within the scale, details and symmetry of the Duomo." Painted Desert • Anaïs & Dax • Arizona "We were walking around a three dimensional painting, delirious from the wind and with no civilization in site. Everything was suspended in time." Gill Nets • Kent Andreasen • Mozambique "Nyati is home to some of the richest waters when it comes to aquatic life. Immensely beautiful scenes like this play out on a daily basis. Unfortunately, the scene is tainted by the mismanagement of natural resources and the depletion of fish species that is destroying this ecosystem." Bodie Ghost Town • Kate Berry • United States "A deserted gold mining town located in the eastern Sierra Nevada Mountain range. It's hard to believe how well preserved the area still is. Like walking around a real-life film set." Marin Headlands • Carina Adam • California "For a few instants, the sun beat away that afternoon's grey, revealing the contrast between rough and smooth outlines of water and stone. I love the Bay Area – not even on darker days does it does forfeit its magic." The 395 House • Kate Berry • United States "I embarked on a solo road trip – 1200 miles over 4 days – prompted by a picture of an abandoned house I had seen online somewhere. Despite not knowing its exact location, I finally passed it on the last day of my trip, on Route 395 back to Los Angeles." Cajon de Maipo • Bruno Candiotto • Chile "In short – pain, crazy symptoms and lush landscapes. That's how I discovered Chile is truly a country of contrasts." Hill Church in Toraja • Oliver Basch • Toraja Utara Regency, South Sulawesi Province, Indonesia "Surrounded by mountains covered with thick rain forests, resting between bamboo trees and rice fields, this tiny Catholic church was a rather rare sight in this mostly Muslim country. In the Torajan region, these two religions co-exist as nowhere else in Indonesia." A Moment of Calm • Lilly Wolf • Morocco "Agadir was completely destroyed by an earthquake in 1960 and had to be rebuilt. You can see both the ruins of the old city and the new buildings from the Kasbah." River Flow • Tsuyoshi Hasegawa • Kyoto, Japan "An area called Arashiyama in Kyoto, Japan, is a place a lot of tourists visit. You can see beautiful sights, sometimes even incredible ones, when you are walking there." From a Road Trip Around the Balkans • Dia Takacsova • Serbia "Last summer we made this van our home and followed the cold autumn, hoping to reach the sea one day..."
Atop the Holy City of Fès • David Jacob • Fès, Morocco "I always feel you haven’t really discovered a city until you see it from above. So when the sun set, we climbed the ruins of an old fortress on one of the surrounding hills to get a spectacular view over Fès." Untitled • Flore Diamant • Olympic National park "Taking a break from the rocky road on our way to Lake Crescent within Olympic National Park." Tree • Nic Ojae • Morocco "I wonder if the tree was planted or if it occurred naturally." Málaga • David Frank • Spain "The beach promenade in Málaga is perfect for a late afternoon run or bike ride. If you stop for just a minute, you can take in the hazy view of the harbor and sea, and dream of distant shores to explore." Yosemite National Park • Kate Berry • United States "I found driving into Yosemite at dusk an emotional and overwhelming experience. The way the mountains turn purple is something I love most about magical California." The View On the Ferry from Anacortes to Friday Harbor • Jeff Ambrose • Washington "With salt in the air and the rumble of engines below our feet, we could tell this day would be one we would always remember. Days spent on the islands usually are." Skógafoss - November 2015 • Henric Marion • Iceland "This analogue image was taken at Skógafoss waterfall in South Iceland from above, with an intimidating 60 meters drop. The scenic views from the top were stunning, as were the texture and colors. The high volume of water comes directly from 2 glaciers and the high volume of tour buses from around the world. If you are lucky with the weather, you can follow the muddy path leading to the river, where natural beauty is all around with at least 20 more waterfalls"
We would like to thank all of our travel blog contributors, with special thanks to: Fran Parente, Anaïs & Dax, Kent Andreasen, Kate Berry, Carina Adam, Bruno Candiotto, Oliver Basch, Lilly Wolf, Tsuyoshi Hasegawa, Dia Takacsova, David Jacob, Flore Diamant, Nic Ojae, David Frank, Jeff Ambrose, Henric Marion. Have a look at our Travel blog for more inspiration and beautiful vistas. If you’d like to see your photos on the travel blog in 2016, just send us a mail with 1) a link to a maximum of four images, 2) locations and 3) a short caption for each.